Of all the arrows that we went to on our trip, this was by far the most difficult to locate and get to. 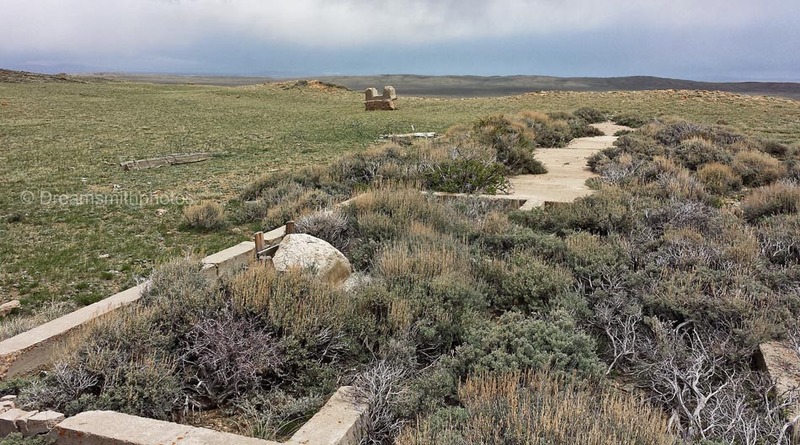 It is located on public lands south of Hwy 30 (Lincoln Hwy), and east of Hwy 72. 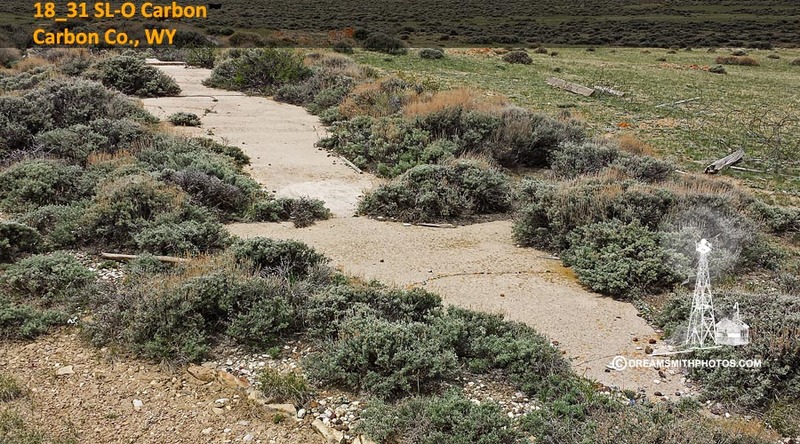 The arrow is located on the top of a ridge (7000+ feet) in an area that is very mountainous with few roads. A four wheel drive vehicle is a must to even get close to the arrow. It can be hiked to, but it would be a long all day trip at a high elevation. Our first attempt to get to the arrow was out an improved dirt road maintained by the county. 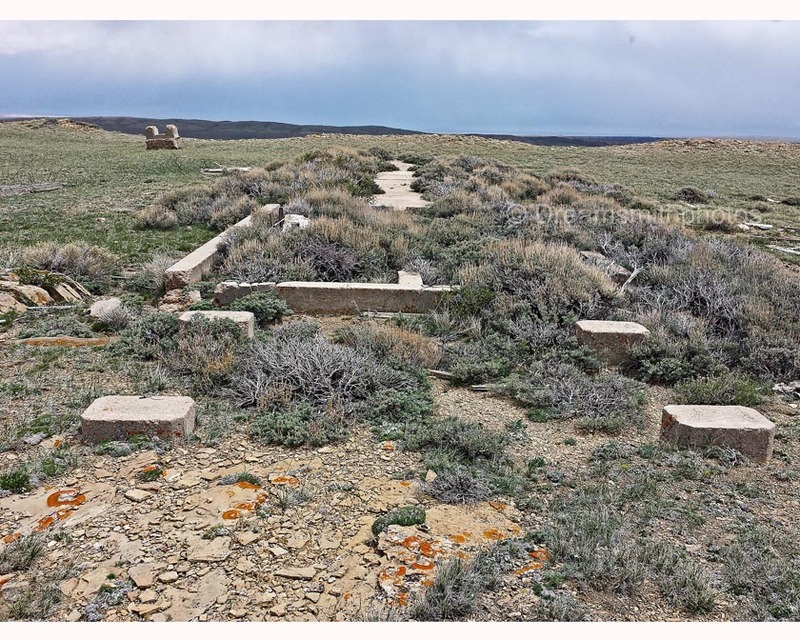 We passed by a couple of cattle ranches, went thru small valleys, and even the remnants of a ghost town complete with a cemetery, searching for a small dirt road that would take us out to the arrow; but with no luck. After driving for about 1 ½ hours we ended up on Hwy 30 about 10 miles south of where we needed to be. We then drove north on Hwy 30 before finding another dirt road leading back into where the arrow was located. This road was narrow with deep ruts, and required four wheel drive to negotiate it. After going in about 3 miles we had to stop, as the road basically ended. At this point we were approximately ¾ of a mile from the arrow (as the crow flies). My wife pointed to a ridge out in the far distance and said that the arrow was on top of the ridge. I left my wife with the car and began to hike. There was no trail to the arrow. I had to hike thru scrub brush down into a small canyon, and then up the side of the ridge to the arrow. The gps coordinates on my smart phone led me directly to the arrow. All the while I was out hiking I kept looking at the storm clouds coming in, and was hoping that they would hold off until we got out of the mountains and back on the highway. Luckily they did. The arrow is basically intact, but is overgrown with scrub brush. However, all that remains of the concrete base where the generator shed stood is the outside concrete perimeter. The rest of the arrow has some minor cracks only. The total length of the arrow is 65 feet. The pilot would approach the tail of the arrow on a compass heading of 90° (East), and then exit the arrow on a compass heading of 90° (East) .